Stories of the disciples - all created in Minecraft! Using images captured from the hit-game Minecraft, these stories of Jesus' disciples and followers adventures makes the Bible look like never before with its unique style. Enter a new world – full of exciting quests, danger, and miracles. Discover the tales of the first Jesus followers from the calling of the first fishermen to the miracle of Peter's escape from prison. Stories of brave and daring people – all created in Minecraft! The Unofficial Bible for Minecrafters: The Jesus Followers by Garrett Romines was published by Lion Hudson Plc in September 2018 and is our 16426th best seller. 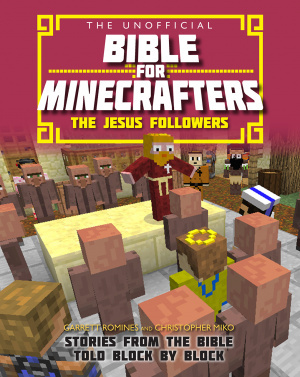 The ISBN for The Unofficial Bible for Minecrafters: The Jesus Followers is 9780745977416. Be the first to review The Unofficial Bible for Minecrafters: The Jesus Followers! Got a question? No problem! Just click here to ask us about The Unofficial Bible for Minecrafters: The Jesus Followers.